Sunday 23rd September is the Autumnal Equinox, when light and dark are equal but with the light (gently at first) giving way to the darkness thereafter. Whilst All Hallows Eve is for me a celebration of this dark, the equinox is about thanking the summer, and saying goodbye……but it is the happiest of requiems, for we know she will return. The spirit of the season burns bright with colour and Autumn makes the most beautiful of funeral pyres for Summer. I feel blessed to live in a country that has seasons. 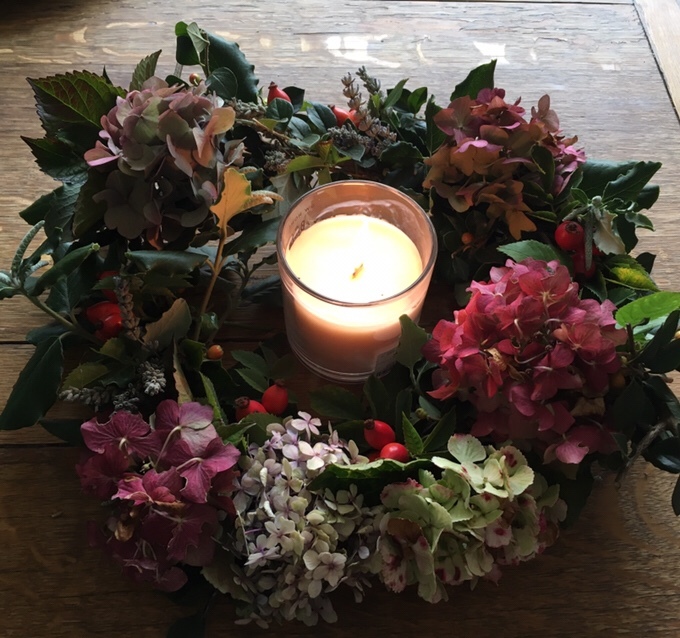 I thrive on the turn of the wheel and the shift in energies, so it was with joy that I made this wreath as a celebration of our wonderful summer and the wild greenery that abounded. For my wreath I used an old wire coat hanger as the base and natural twine to twist the twigs in place. For the greenery I used the off cuts of things we had clipped back in the garden, using the fuller branches as the base and then building on top. Look for evergreen plants as they often dry well and keep colour. The wreath is mainly Hydrangea, Rose Hips, Cotoneaster and Lavender, all foraged from the garden. I think it looks equally pretty on the wall and as a center piece with a candle and it will be joining us at the table for our Equinox celebration. It felt good to gather and then to just sit and twist the branches and flowers into the patterns of the wreath. I weaved a thank you to the summer and wished goodbye. Sending equinox blessings to you. This is absolutely beautiful! A fulsome tribute! It’s certainly been a wonderful summer.